On 12 January 1174, Sancha was married to Alfonso II of Aragon--he was linked to her father not only by his position as a vassal of Castile but by their shared dedication to wiping out the Muslim kingdoms of the Iberian peninsula. According to Antonio Ubieto Arteta's Historia de Aragón, Sancha's dowry was "amplia"--including many castles and territories in Aragon and Catalonia. After Alfonso II's capture of Cuenca from the Moors, an important step in the Reconquista, he was released from his tie of vassalage to Castile. 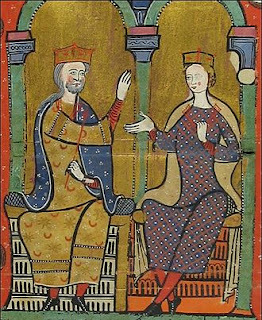 Alfonso was noted for his consolidation of Catalonia: his father, Raymond Berenguer, was the count of Barcelona, a title Alfonso inherited; Alfonso conquered Provence in 1166, becoming count of Provence; the dowry he received with his marriage to Sancha added to his influence in the region. But Alfonso was not only a warrior, he was also a troubadour poet, thus participating in the twelfth-century literary, chivalric, and courtly love culture that originated in Aquitaine, Provence, and Champagne and spread to Catalonia and northern Italy. As queen of Aragon, Sancha too participated in court culture, primarily as a noted patron of troubadour poets. But for Sancha, there was more than the pleasant fiction of courtly love to occupy her time. In 1177, while her husband was in Provence, Sancha entered into "the countship of Ribagorza, and took possession of the fortresses and castles there, which belonged to the crown." Despite this description in a contemporary chronicle, which gives no further details of what might have motivated Sancha to assert herself in these extraordinary actions, these were possessions that had been part of her "ample" dowry. And, over the course of the twenty years of her marriage, Sancha also gave birth to at least eight children, seven of whom survived into adulthood. The first, Pedro II, who would succeed his father as king, was born soon after her marriage in 1174, the last, Dulcia, was born nearly twenty years later, in 1192. It was the main monastery for nuns of the Order of St. John of Jerusalem and it accepted, “dueñas” (owners) or prominent religious women from the most noble families of Aragon. 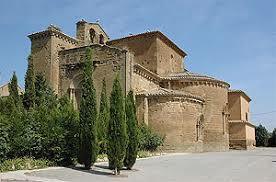 The first nun ordained at this monastery, was Doña Dulce, daughter of Doña Sancha and King Alfonso II of Aragon. She died the following year and was buried in the monastery. 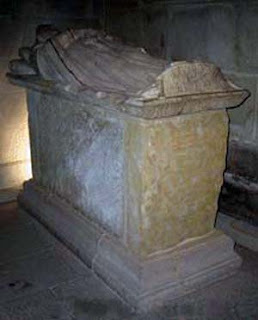 Also buried in it was its founder: Doña Sancha of Castile (daughter of Alfonso VII "El Emperador" (The Emperor) and her son King Pedro II "el Católico" (the Catholic). Apart from being a hospitable monastery and a Royal Pantheon it also had the role of a court archive. At its peak in the fourteenth century, more than 100 nuns, daughters of noble families of the Kingdom, came to live there with their attendants and servants. Queen Sancha's reason for leaving the court and taking up residence in the convent may not have been purely spiritual--according to E. L. Miron's The Queens of Castile: Their Lives and Times (1910), she was motivated less by grief for her husband or religious devotion than the "wounds dealt her by the ungrateful conduct of her son." According to Miron, Pedro had given his mother no role or function in his court--although later in life, a reconciliation seems to have taken place, with the king seeking his mother's wisdom and counsel. In addition to her daughter Dulcia, who died in St. Sigena when she was just eleven years old, Sanchia's daughter Leonor (b. 1182), also spent time in the monastery. She had been brought up there, in fact, but in 1200 she left St. Sigena to be married to Count Raymond VI of Toulouse--she was his fifth (or perhaps his sixth) wife. She returned to St. Sigena about two years later, after she was abandoned by her husband. After her death, Queen Sancha of Aragon was buried near the altar of the church in St. Seger. A kind of cult seems to have developed--according to Miron, "in times of scarcity," when the poor suffer, "tears of blood" seem to issue from "the tomb of the pious queen." Bits and pieces of Sancha's story are available here and there--but the most extended account I have been able to find is Miron's book on queens of Aragon, cited above. It's dated, but at least it pays attention to the royal women of Aragon! *Alfonso's formidable mother was Urraca of Castile and León, "empress of all the Spains." 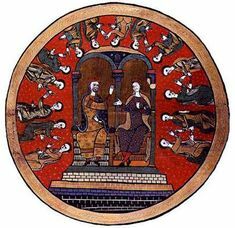 Alfonso VII also fathered several illegitimate children, including Urraca Alfonso (1133-c. 1179), who would become queen of Navarre and, after her husband's death, regent of Asturias. After Alfonso's death, Richeza was married twice more, to Ramon Berenguer II, the count of Provence, and to Albert III, count of Eberstein. Richeza gave birth to a daughter in her second marriage and to two sons during her second.